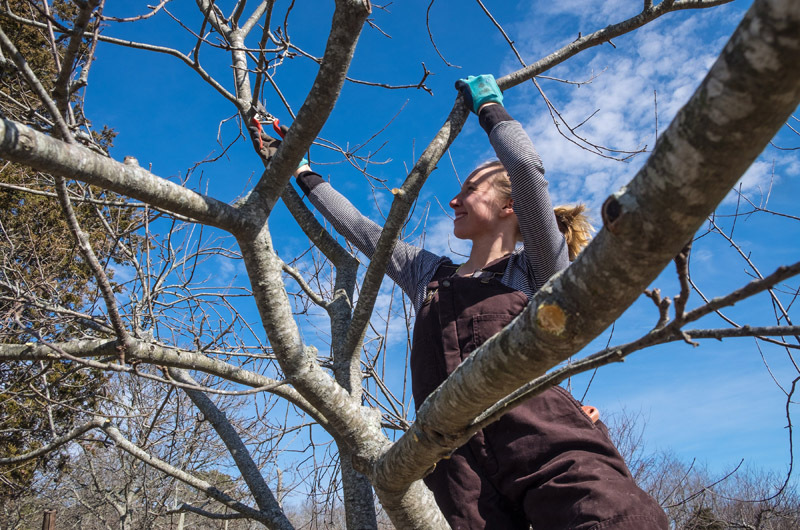 Michelle Tynan prunes an apple tree at Mermaid Farm. 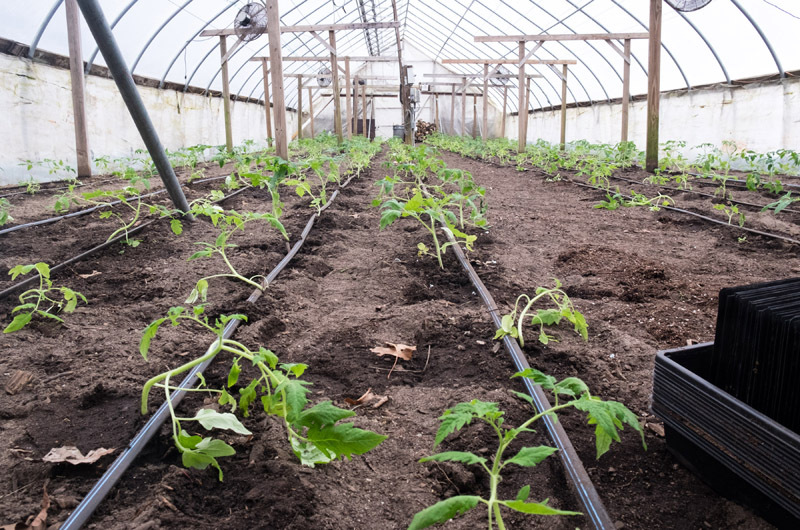 As the days lengthen and the weather grows even milder, farmers around the Island are pulling out their potting soil, clearing greenhouses and seeding their crops. But they are also watching the weather closely before taking to the fields to avoid a late killing frost. 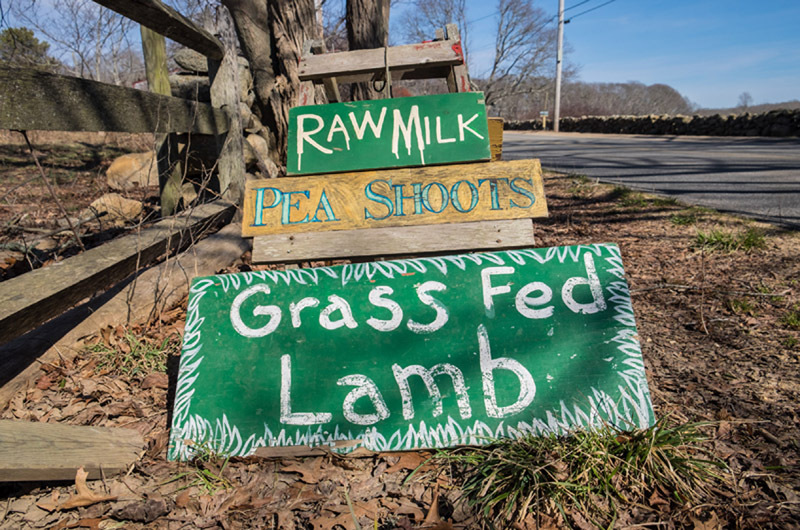 Inside the farm stand at Ghost Island Farm in West Tisbury, Rusty Gordon has a cluster of hopeful green shoots pushing up through the soil. Later they will be moved into heated greenhouses and then in May or June planted in the fields. Mr. Gordon is a tomato specialist and he is doing some experimenting to try and get some tomatoes ready by mid June. He also plans to plant onions, potatoes and an array of leafy greens as the weather warms. Last year the heavy snowfall insulated his greenhouses and kept the plants warm. This year he had to cover his winter crops with a blanket. But despite the warm winter, he is reluctant to transplant into the fields yet. He recalled two season ago when a late May frost killed many farmers’ crops. “That’s a time you want to be really careful,” Mr. Gordon said. Andrew Woodruff started his seedlings under grow lights this week at Whippoorwill Farm in West Tisbury. He will move them into the greenhouse soon before transplanting to the fields later this spring. The Vineyard tends to have warm falls and chilly springs, he said. “The ocean works in our favor in the fall and then in the spring it’s much colder here,” he said. This year Mr. Woodruff is experimenting with a new no-till system. Right now, his fields are sprouting cover crops (red clover, buckwheat and daikon radish) that he will mow over later to create a nutritious mulch for his harvesting crops to be planted in. Mr. Woodruff said the layer of mulch creates a nutrient rich soil and keeps the temperature of the soil consistent while trapping moisture. There are a lot of nuances with the new system, but after a few years of fine tuning, he hopes it will result in healthier land. Earlier this week, Mr. Woodruff stood in an apple tree helping fellow farmer Caitlin Jones of Mermaid Farm prune the tree. A few sheep trotted over to watch, bleating. Ms. Jones said it was the first time she had penned the sheep with the fruit trees and had to construct makeshift barricades to keep them from stripping the bark from the trunks. The newest addition to the woolly herd, a week old lamb named Snowdrop, peeked out from behind her mother’s legs. Ms. Jones marks spring with a series of natural events. When the cherry trees bloom, she knows to listen for the Baltimore oriole. And when the shadbush blooms the herring must be running. But before the trees bud and the sap flows, it’s time for pruning. While Ms. Jones focused on the orchard, her farm worker Caitlin Kroll seeded onions in the covered greenhouses, and cheese maker Michelle Tynan worked on tomme, a four month aged cheese. The goods are sold at Mermaid Farm’s year-round farm stand on Middle Road. In Vineyard Haven, Jefferson Munroe focused on his baby animals. The Good Farm primarily produces meat, and a new batch of ducklings nestled in the warm hay. In a couple of weeks they will be out roaming the farm with his laying ducks, geese and chickens. They are ready for slaughter at about 10 weeks old. Also out enjoying the mild weather was a small herd of hairy black pigs. Next week turkeys will arrive. Mr. Munroe has spent the winter tinkering around his property before his season picks up in mid-April. His farm manager recently returned and they are shifting some focus to the raspberry and fruit trees. Up in Chilmark, the Grey Barn has kept its coolers well stocked all year long with meats and cheeses. Farm manager Michael Barnes said they are beginning to seed their fields with grass, clover and alfalfa. Cheese production is also picking up. “Our milking herd will be almost full capacity come May,” Mr. Barnes said. As the farmers all look to spring they are hoping for rain, which was a rare occurrence in recent years. Island farms are uniquely positioned to grow the delicious foods that we love to eat while preserving the land, views capes and way of life that is so Vineyard. 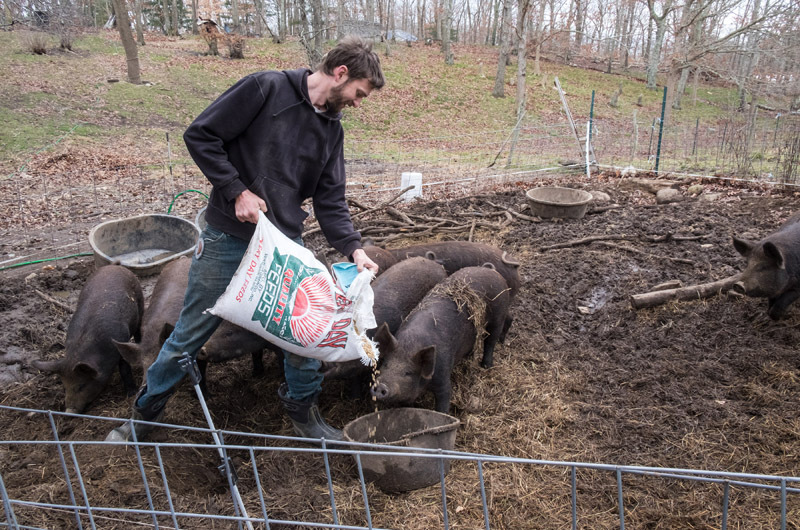 Thank you for the nicely written article and reminder to get things going with my own seeds, brush clearing and fence mending to keep the sheep from wandering around Lambert's Cove at Old Mayhew Farm. Brian Athearn, Dr. Jacobs and Bruce Marchand are getting itchy to farm after the cold winter spell that we've had and ready for another growing season.